HTG is the name to trust for a proper design, installation, and programming of all your Hi-Tech home systems. We are a family owned & run telecommunications infrastructure design & integration firm with experience in the health care market. As you work with us to best determine your lifestyle and homes needs, we believe you will find our 35 years of practical on the job design and installation experience in commercial electrical, communications, and building control & automation systems as one of the key characteristics that differentiates us. We understand that life is not simple, your time is valuable, and your family is precious. We understand and believe that emotional health will affect physical health. We believe in being proactive and self-health awareness is valuable for long term wellness. We believe in the positive holistic attributes of tele-health technology. We appreciate your business and knowing you have a choice we don’t take it for granted, we are grateful to have you as one of our clients. You can expect your family to be treated as a member of our family. You can expect HTG to meet your expectations as your chosen technology contractor-You can expect HTG to be honest, truthful, and compassionate towards your needs. SALES PERSON: Self motivating PT/FT comission based sales personal with healthcare industry experience. Nursing degree RN, LPN, Doctor, Physical Therapist a plus. 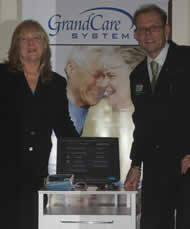 TECHNICIANS: PT/FT technicians interested in learning about GrandCare and the Home Automation industry. Must be computer literate.